36 year old Deborah Ann Morales of Livingston is facing a felony DWI. Driver Totals Truck, Alcohol Suspected, LIVINGSTON, July 4, 2013 - At approximately 11:30 pm on July 3, 2013, a green 1998 Dodge pickup driven by Deborah Ann Morales, 36, of Livingston, was south-bound on Pine Street. Morales apparently failed to notice an 18 wheeler that was legally parked on Pine Street next to the Livingston High School football field (The Lion's Den). She slammed into the back of the 18 wheeler and totaled her pickup. Sergeant Chad Ward, Jason Thomas, and Adam Williford (all with Livingston PD) were dispatched to the scene. Sergeant Ward administered a field sobriety test on Morales and placed her under arrest for suspicion of driving while intoxicated. 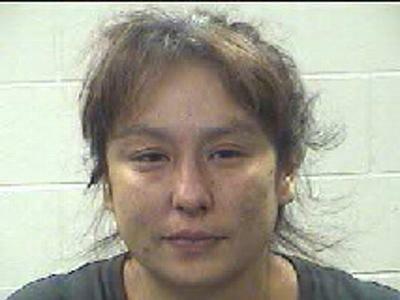 For Morales, this is bad news since this is at least her third DWI making this DWI a felony. Morales was also driving with a driver's license that has been expired since 2004. Morales was driven to Livingston Memorial Hospital for a mandatory blood withdrawal. Traffic on Pine Street was blocked during investigation and cleanup. Her vehicle was recovered by LakeView Wrecker Service and will be stored in Livingston. Morales' 1998 Dodge pickup sits in the middle of Pine Street (Next to the football stadium) totaled when she slammed into the back of a legally parked 18 wheeler. There were no tire marks on the road to indicate that she ever applied her brakes. The passenger's side was completely caved in. Had there been a passenger, it probably woudl've been a fatal accident. Cold alcoholic beverage was pulled from Morales' truck. Morales' vehicle was recovered by LakeView Towing. Solo Flight: Mixi made this trip without the usual assistance of her sister, Molly.